After you have a video on your iPhone or as soon as you begin downloading from the iTunes Store, tap Videos on the Home screen, and then tap the button in the Browse Bar for the type of video you want to watch: Movie, Rentals, or TV Shows although you only see the categories in which you have media. If you have Home Sharing turned on, you also see a Shared button. Tap the video you want to watch. Tap the video you want to watch and an information screen opens. Like the iTunes Store, you can tap the Details tab to see a detailed description about the video or Related to see similar videos. 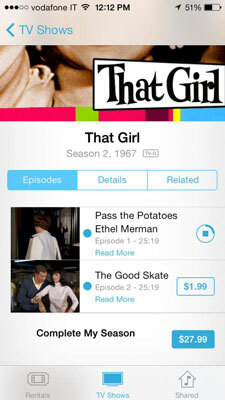 Tapping a related video opens the iTunes Store to information about that item. Tap a TV show and you see a list of episodes you have. 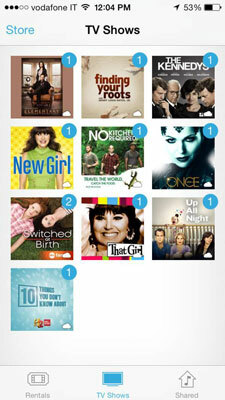 The number on the TV show button in the TV Shows screen indicates the number of episodes you have. There’s also an option to show the complete season. When you tap that option, episodes you don’t have appear on the list and you can purchase them directly by tapping the price button. Tap the Play button to start the video. Even if it’s still downloading you can begin watching. Most video’s display in landscape view, the exception being if video was recorded with either camera on iPhone in portrait view. Done: Press when you want to stop watching and return to the Videos list. If you stop watching before a video is finished, when you start again, it picks up where you left off. You can also press the Home button to stop watching and return to the Home screen. Playtime Scrubber Bar: The time on the left is the time the video has played; the time on the right is the time remaining. Drag the white ball, known as the playhead, right and left on the scrubber bar to move forward and backward in the video. Slide your finger down as you drag the playhead to adjust the speed at which the video moves. Volume Scrubber Bar: Drag the white ball on the volume scrubber bar to raise or lower the volume. You can also use the volume buttons on the side of your iPhone. 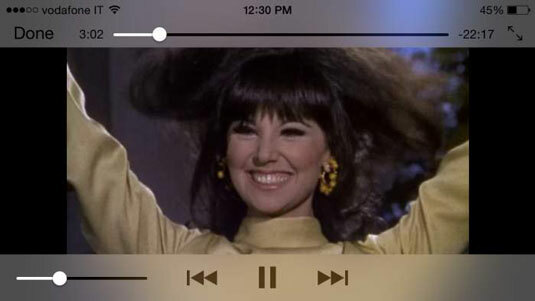 Rewind: Tap and hold to rewind; tap once to return to the beginning of the episode. If you’re watching a movie that has chapters, tap twice to go back one chapter. Play/Pause: Tap to pause the video and tap again to resume playback. Fast forward: Tap and hold to fast forward; tap twice to go to the next chapter. If you’re wearing the EarPods, you can use the volume buttons on the microphone. You can also click twice on the center part to skip to the next chapter, or three times to go back a chapter. Fill/Fit: Tap the Fill/Fit button to toggle between two ways you can view video. Choose Fit to see videos in their original aspect ratio, although you will see black vertical or horizontal bands, called pillarboxing and letterboxing, respectively, depending on the ratio at which the original video was captured. Choose Fill to fill the whole iPhone screen but lose some of the edges of the original version. Language: Some movies have subtitle or language options. This button appears when they are available. Tap to see your options. Audio Output: Set the output device you want to use to view your video on another monitor.